Traditional Hawaiian surfer style Aloha! Natural shiny North Shore Puka Shells washed up from the ocean surf and an amazing jumbo sized classically colored Sunrise Shell centerpiece pendant in this local style necklace design originating on Oahu, Hawaii! 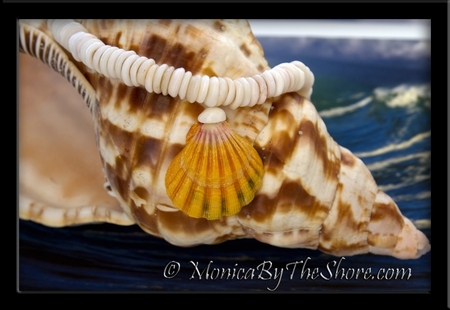 This amazing bold yellow, pink and white with splashes of green Sunrise Shell is a full 1 1/2 inches in size! An exceptional mature seashell with very thick ribs and perfectly shaped! 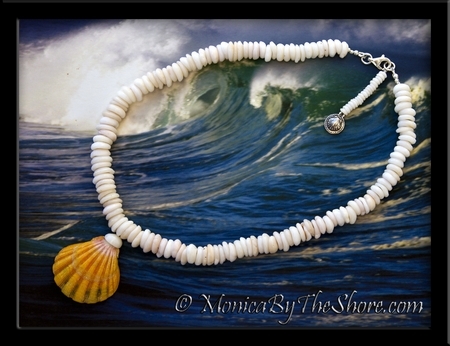 As an added detail a strand of tiny Puka Shells dangle a sterling silver Scallop Shell charm at the clasp! This local Hawaiian Island style Puka Shell lei necklace is 17 inches in length, suitable for a man or woman to wear with Aloha. Authentic North Shore style, to be worn with a warm smile when you accept all those sincere compliments! A MonicaByTheShore original rare Sunrise Shell jewelry design, hand crafted with Aloha on the North Shore in Haleiwa and Honolulu, Hawaii.